Based on Rickerby Hinds’ (who co-writes here) hip-hop theatrical production Dreamscape, which depicts the real-life death of 19-year-old Tyisha Miller at the hands of the police in 1998, My Name Is Myeisha is a shocking, timely, and riveting film which features an incredible tour de force performance by Rhaechyl Walker as its raw, beating heart. 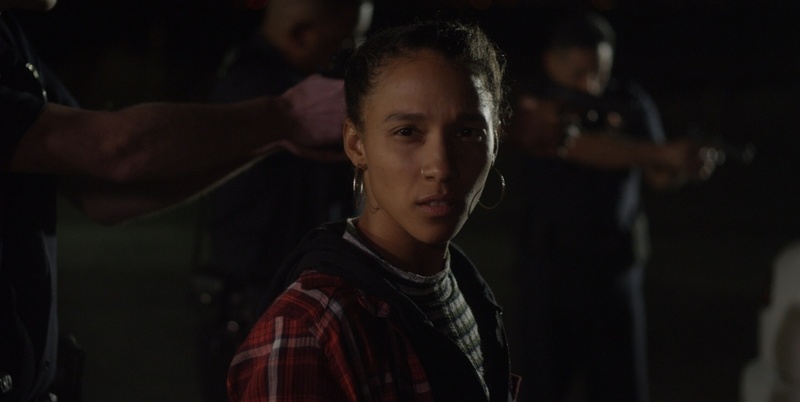 Walker plays Myeisha Mills, a (very) slightly fictionalized version of Miller, and while the film begins with a standard recreation of the events leading up to her death, things quickly expand into various stunning tangents, from Myeisha and her friends’ surprising music video appearance, to deciding between Wesley Snipes and Denzel Washington’s hottest roles, to various explorations of what it meant – and means – to be a black person in America. Myeisha is front and center throughout, often addressing the camera, telling her story in poetic fragments punctuated by brief musical interludes. Its stagebound origins are apparent throughout, but director Gus Krieger brings some powerful, though minimal, visual flourishes. None more powerful than the continual return to Myeisha’s autopsy room, where the 12 bullets that tore through her body are used as sobering chapter stops. John Merchant plays the pathologist performing the autopsy, as well as most of the other male roles in the film, while also providing beatboxing accompaniment to the music throughout. While far removed from the explosive performance from Walker at the film’s core, it’s equally impressive. It makes for a haunting and emotionally exhausting experience, though somehow the final hail of bullets that ends Myeisha’s life still seems to come as a horrifying surprise. My Name Is Myeisha is unique and powerful, and despite its 1998 setting feels sadly reflective of 2018.